Domestic Apologist: Lost in time. On April 2, 2005, I sat in my dorm room and cried, watching coverage from St. Peter's Square. Pope John Paul II had just died. The preceding Lent and Easter had been filled not only with the news of Pope John Paul II's impending death, but also the unfolding drama of Terri Schiavo's death by dehydration. It had been an intense month, watching the suffering (one elderly and, while sad, natural; one terribly, terribly unnatural, vile and criminal) of two beautiful souls. Today, a text message at 6 a.m. brought news not that Pope Benedict had died or would presumably be passing soon, but that he had resigned the papacy. I've spent this day like many of my friends, I think: sporadically reading snippets and clumps of words here and there as to the reasons, the rationale, the reality of this news. I haven't reacted with tears (yet, at least), but I do have a deep sense of missing my opportunity to know Pope Benedict the way I felt I knew John Paul II. I've heard the analogy, made from a standpoint of admiration of both men, that JPII was the rockstar pope, and Benedict, the teacher. We all feel like we "know" rockstars, whether through photos, soundbites or just cults of personality. But to know a teacher, you have to be a student in their classroom. John Paul II gave me from my birth until age 21 to know him as pope. 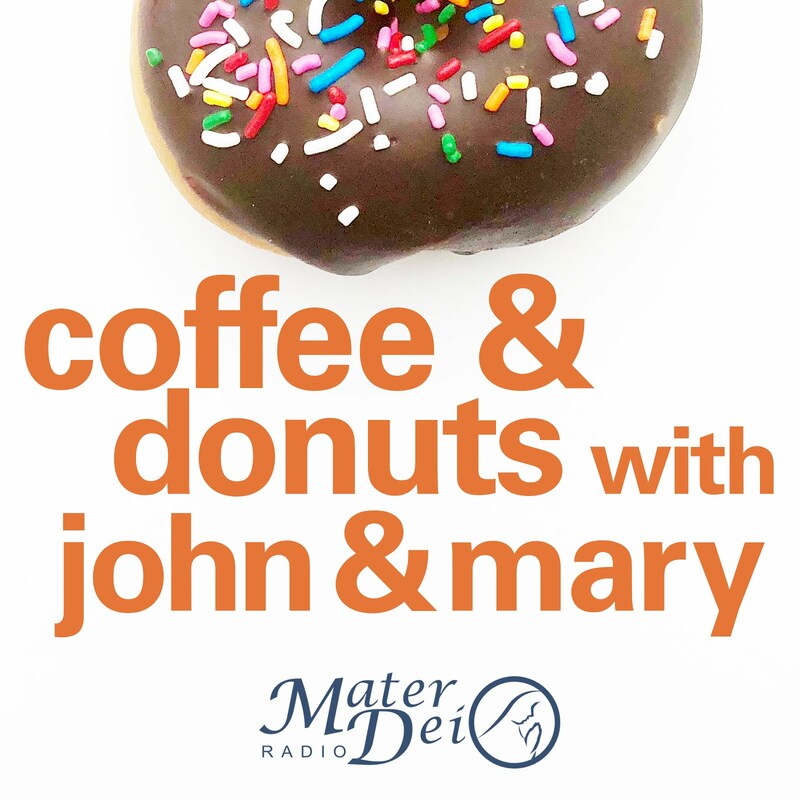 Benedict gave me just the last eight years, nearly three of which I've spent as a mother with little time to hear myself think, let alone delve into Benedict's Jesus of Nazareth. But still. Eight years is nearly a decade. And here I am, on February 11, knowing little more about the writings of Pope Benedict than I do of any other modern apologist. And I know that's just an excuse. After all, folks say that it's Benedict's writings that are arguably more accessible than John Paul II's. I know other moms with roughly my same child count/workload who are able to work in much more reading time into their days. I wish I could say that for Lent this year, I'm ordering the study guides and just plowing through the Infancy Narratives. But three other unread (and very good) books stare at me daily from my kitchen counter already. Something tells me that should I start ordering books today, that pile will just grow taller. And more dusty. This all leads me to my youngest, my sweet baby Ambrose. Approaching 10 months old in a few weeks, I've committed the second-child sin: I've been much more lax in documenting Amby's baby development than Joseph's. All of those little steps: the second-month smiles, the fourth-month rolling over, the six-month first foods... I captured most with a photo, but few with written words in his baby book. Granted, it's hard to write anything when two little humans under age three are up and at 'em. But I could have, if I really wanted to. And I've let a lot slip by. After a few weeks of pondering just what I'd undertake for Lent, I believe I have my answer. Every day, I will document one story, one fact, one snippet of life for one of my boys in their baby books. And I will finish one of those three unread books. I will work toward these goals knowing that once my unread-book pile becomes a books-I-read-and-loved pile, I'll be ready to order Jesus of Nazareth. It's time to stop losing things in time. Also: Today is the Feast of Our Lady of Lourdes. Sean made a week-long solo pilgrimage to Lourdes in 2011, seeking healing for his vast array of pains and undiagnosed, chronic, worsening illnesses. In God's infinite wisdom, He didn't grant Sean a miracle while there. 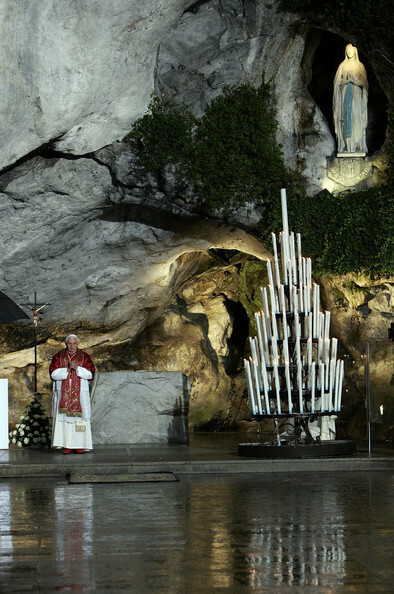 But Our Lady in the grotto remains our life, our sweetness and our hope. 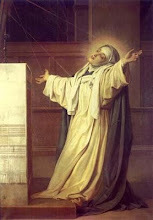 And we'll pray for her to accompany Pope Benedict through the remainder of his journey on earth. Your words captured my exact feelings about our Dear Papa! I think I'll 'get to know' him better once I can pick up his book. And, some day we'll have time to read again... I guess even Mommies have to take baby steps, huh?